Today, the Mortimer & Mimi Levitt Foundation awarded $375,000 in matching grants to 15 nonprofits serving small to mid-sized towns and cities across America to produce free outdoor concerts, as part of the third annual Levitt AMP [Your City] Grant Awards. Reflecting the Levitt Foundation’s commitment to creative placemaking projects generating community support, once again the Foundation opened the AMP selection process to the public to choose the top 25 finalists. In July, the Levitt Foundation invited nonprofits to submit proposals that would reflect the three goals of the Levitt AMP awards: Amplify community pride and the city’s unique character; enrich lives through the power of free, live Music; and illustrate the importance of vibrant public Places. Nonprofits that received a Levitt AMP grant in previous years were eligible to reapply. 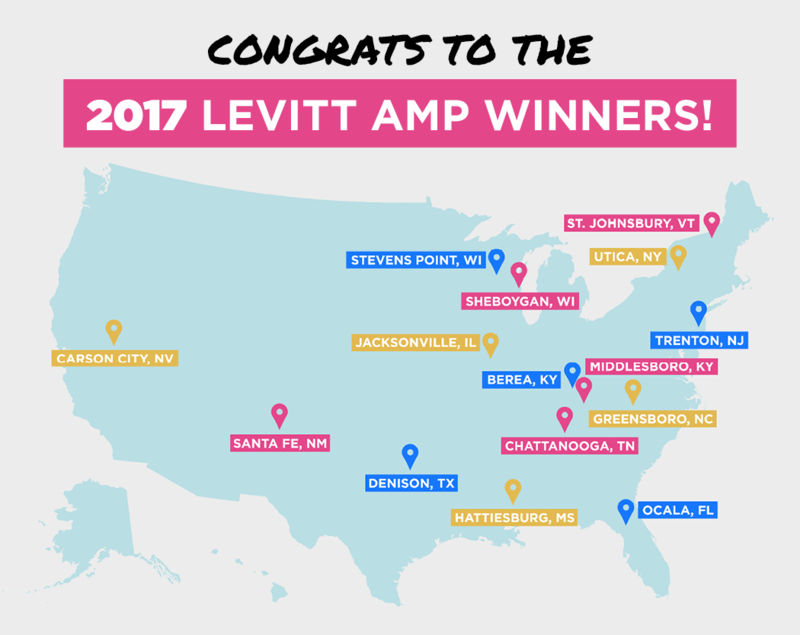 The 15 Levitt AMP winners hail from small towns like St. Johnsbury, Vt.; Middlesboro, Ky.; Berea, Ky.; Jacksonville, Ill.; Denison, Texas; Stevens Point, Wis.; Hattiesburg, Miss. ; and Sheboygan, Wis.; to mid-sized cities spanning the country including Carson City, Nev.; Ocala, Fla.; Utica, N.Y.; Santa Fe, N.M.; Trenton, N.J.; Chattanooga, Tenn.; and Greensboro, N.C. Each winner will present 10 free concerts featuring a diverse lineup of high caliber entertainment in 2017 as part of the Levitt AMP Music Series, for a total of 150 free Levitt AMP concerts. The Berea Arts Council will present the Levitt AMP Berea Music Series to reinvigorate the city’s “Old Town” Artisan Village, a historic site with a rich musical tradition that has experienced increased crime and economic hardship in recent years. The series will reinvigorate an existing music series that has suffered from a significant decrease in funding, while fostering an inclusive environment where all can enjoy a diverse range of music styles. Last year the Brewery Arts Center brought the Levitt AMP Carson City Music Series to life on the Minnesota Street Stage, transforming an abandoned corridor into a point of community pride that brought together people from all walks of life. The 2017 series will further activate downtown Carson City’s Historic District, helping to realize its potential as an epicenter for the arts. The Urban League of Greater Chattanooga will present the Levitt AMP Chattanooga Music Series, activating the lawn of the Bessie Smith Cultural Center in the historic Martin Luther King district, and shining a light on its renowned musical heritage while reestablishing it as a thriving cultural destination. For the past two years, the Levitt AMP Denison Music Series, presented by Denison Main Street Inc., has seen increasingly larger audiences, more downtown foot traffic and amplified community pride. This year the series aims to build on this, reinforcing the relevance of the city’s core in the midst of investment in its outskirts. The Levitt AMP Greensboro Music Series, presented by ArtsGreensboro, sparked widespread enthusiasm for East Greensboro’s newly renovated, yet underused, Barber Park, when it launched last year. Building on that momentum, it seeks to continue fostering unity among community members and to become Greensboro’s premier outdoor music destination. The University of Southern Mississippi will present the Levitt AMP Hattiesburg Music Series to invigorate Chain Park, transform it into the city’s cultural gateway and position the space as a centerpiece for community enrichment, strengthening the symbiotic relationship between the University, the city’s residents and the arts. Jacksonville Main Street will present the second Levitt AMP Jacksonville Music Series in the historically rich Central Park to further fuel the revitalization of the city’s downtown core. With businesses in the area newly thriving, the series intends to build on that momentum and continue to draw residents and visitors from throughout the region to enjoy free outdoor music. Through the Levitt AMP Middlesboro Music Series, third-year grantee Discover Downtown Middlesboro has transformed a gravel lot into the Levitt AMP Pop Up Park—a vibrant gathering space complete with a volunteer-installed lawn and donated permanent stage. The 2017 series will build on this momentum, augmenting the community-driven revitalization of its downtown. Marion Cultural Alliance will present the Levitt AMP Ocala Music Series in Webb Field, a currently underutilized space located in a once-thriving neighborhood in West Ocala. The series aims to bring local residents, as well as visitors from other areas, to West Ocala by building awareness of the neighborhood’s ongoing revitalization efforts. The nonprofit AMP Concerts will present the Levitt AMP Santa Fe Music Series at The Santa Fe Railyard in the heart of the city, positioning the iconic outdoor space’s existing concert series to reach its potential, by elevating the mix of talent presented in hopes of appealing to a wider audience, connecting the city’s diverse communities and increasing civic pride. Levitt AMP Sheboygan has flourished over the past two years, sparking significant investment in the area and bringing people together in the heart of downtown. The John Michael Kohler Art Center will present Levitt AMP Sheboygan for the third year, furthering efforts to increase community pride, drive the local economy, and revitalize formerly dormant public spaces. Catamount Arts will present the Levitt AMP St. Johnsbury Music Series on Dog Mountain, a bucolic, dog-friendly spot in the center of a blighted former industrial area that has been depressed economically. The series aims to build bridges across socioeconomic divides, provide cultural access, and restore community pride compromised by poverty and unemployment. Create Portage County will present the Levitt AMP Stevens Point Music Series in Pfiffner Park along the Wisconsin River, with the goal of creating a thriving city center that offers urban amenities in this small community, as well as a more lively cultural scene designed to attract people from all walks of life and entice young people to stay in the area. Now in its third year, the Levitt AMP Trenton Music Series presented by the Trenton Downtown Association will build upon its progress, spurring economic activity and community participation in the state capital’s historic downtown area, and bringing cultural and community activities to the once-neglected Capital Green. Last year’s Levitt AMP Utica Music Series fueled the social, physical and financial resurgence of Oneida Square, bringing long-time and refugee residents together to reenergize Kopernik Park and its surrounding neighborhoods. This year’s series will continue to bring life to this formerly underutilized space, drawing people together to create a stronger, more unified community. In addition to the monetary award of $25K each in matching funds to produce the 10 free concerts, Levitt AMP grant recipients will also receive the Levitt AMP Toolkit containing valuable resources to help them successfully produce their concert series. Congratulations to these 15 communities and stay tuned for updates on concert dates and performers on levittamp.org! This entry was posted in Levitt AMP, Levitt in America on January 5, 2017 by Lucy Truong.